Human NK cells have been shown to produce cytokines (e.g., IFN-γ and TNF-α) and the chemokine macrophage inflammatory protein (MIP)-1α following stimulation with the combination of two monokines, IL-15 plus IL-12. The C-C chemokines MIP-1α, MIP-1β, and RANTES have been identified as the major soluble macrophage-tropic HIV-1-suppressive factors produced by CD8+ T cells, which exert their action at the level of viral entry. Here, we demonstrate that monokine-activated NK cells, isolated from both normal and HIV-1+ donors, produce similar amounts of MIP-1α, MIP-1β, and RANTES protein, in vitro. Further, supernatants of monokine-activated NK cells obtained from both normal donors and AIDS patients showed potent (routinely ≥90%) suppressive activity against HIV-1 replication in vitro, compared with unstimulated control supernatants. NK cell supernatants inhibited both macrophage-tropic HIV-1NFN-SX and T cell-tropic HIV-1NL4–3 replication in vitro, but not dual-tropic HIV-189.6. Importantly, the C-C chemokines MIP-1α, MIP-1β, and RANTES were responsible only for a fraction of the HIV-1-suppressive activity exhibited by NK cell supernatants against macrophage-tropic HIV-1. Collectively these data indicate that NK cells from normal and HIV-1+ donors produce C-C chemokines and other unidentified factors that can inhibit both macrophage- and T cell-tropic HIV-1 replication in vitro. Since NK cells can be expanded in patients with HIV-1, AIDS, and AIDS malignancy in vivo, this cell type may have an important role in the in vivo regulation of HIV-1 infection. The NK cell is a critical component of the innate immune response to a variety of viruses, fungi, parasites, and bacteria (1, 2, 3, 4). Resting human NK cells constitutively express a number of cytokine receptors and secrete immunoregulatory cytokines following receptor activation (5, 6). We have previously shown that the monocyte/macrophage-derived cytokines (monokines) IL-15 and IL-12 are potent costimulators of IFN-γ, TNF-α, as well as the C-C chemokine macrophage inflammatory protein (MIP)3-1α, production by human NK cells (7, 8, 9). HIV-1 isolates are categorized as macrophage-tropic (M-tropic), T cell-tropic (T-tropic), or dual-tropic, based upon their ability to replicate in monocyte-derived macrophages and/or T cell lines (10). Soluble factors derived from the culture supernatants of activated CD8+ T cells have been shown to suppress the replication of HIV-1 in vitro (11, 12). The C-C chemokines MIP-1α, MIP-1β, and RANTES have been identified as major CD8+ T cell-derived M-tropic HIV-1-suppressive factors (13) and act by competitive binding to CCR5 or by down-regulation of surface CCR5, the primary coreceptor for M-tropic HIV-1 entry into target cells (14, 15). Wagner et al. have recently shown that the C-C chemokines are released from the CD8+ T cell cytolytic granules complexed to proteoglycans and, in this form, exert greater inhibition of HIV-1 replication (16). Similarly, CXCR4 has been identified as the coreceptor for T-tropic HIV-1 entry (17) and is inhibited by its natural CXC chemokine ligand, SDF-1 (18, 19). Based upon this correlation between cellular tropism and coreceptor usage, it has been proposed to refer to M-tropic HIV-1 strains that utilize coreceptor CCR5 as R5 viruses, to T-tropic strains that use coreceptor CXCR4 as X4 viruses, and to dual-tropic strains utilizing both coreceptors as R5X4 viruses (20). Exogenous, s.c. administration of ultra-low dose IL-2 has been shown to selectively expand human NK cells in vivo (21, 22, 23). We have observed a significant, selective expansion of this subset of innate immune effector cells in both phase I (21) and phase II (23) studies of ultra-low dose IL-2 therapy given to patients with AIDS and AIDS-associated malignancies, when CD4+ T cells are often below 100/mm3. Additionally, we have shown that ultra-low dose IL-2 therapy can increase endogenous IFN-γ gene expression in these patients in vivo, as well as enhance IFN-γ protein production by LPS- and Toxoplasma gondii-stimulated PBMC in vitro (24). Thus, the human NK cell represents an expandable reservoir of cytokine producing cells in HIV-1-infected patients. In the current study, we investigated whether NK cells derived from HIV-1-infected patients produce C-C chemokines, and whether monokine-activated NK cells from such patients could inhibit HIV-1 infection in vitro. Purified recombinant human (rh) IL-15 was provided by Immunex Corporation (Seattle, WA). Purified rhIL-12 (sp. act., 4.5 × 106 U/mg) was obtained from Genetics Institute (Cambridge, MA). Purified rhIL-2 (spec. act., 18 × 106 IU/mg) was obtained from Chiron (Emeryville, CA). All cytokines were reconstituted in sterile PBS with 0.1% human albumin (Armour Pharmaceutical, Kankakee, IL). Neutralizing goat anti-human MIP-1α, MIP-1β, and RANTES polyclonal Abs were purchased from R&D Systems (Minneapolis, MN). Normal goat Ig was used as a control (R&D Systems). PE-conjugated anti-human CD56 mAb was purchased from Coulter Immunology (Hialeah, FL), and PE-isotype control mAb were purchased from Becton Dickinson (San Jose, CA). Studies were performed on blood obtained after informed consent from seven HIV+ patients receiving highly active antiretroviral therapy (HAART), with HIV-1 RNA < 200 copies/ml of plasma by PCR. Blood was also obtained after informed consent from two patients with AIDS receiving ultra-low dose IL-2 therapy, as described (23). PBMC were obtained from patients with HIV-1 infection or AIDS, or from normal donor fresh leukopacs (American Red Cross, Columbus, OH) using Ficoll-Hypaque (Sigma, St. Louis, MO) density gradient centrifugation. Red blood cells were lysed, after which PBMC were washed twice in RPMI 1640 supplemented with 10% human AB serum (HAB, C-six Diagnostics, Mequon, WI), antibiotics, and anti-PPLO (Life Technologies, Grand Island, NY) (10% HAB), and cultured for 2 h in plastic tissue culture dishes to remove adherent monocytes. T cells, B cells, and remaining monocytes were depleted using goat anti-mouse immunomagnetic beads (PerSeptive Biosystems, Framingham, MA) and a combination of murine mAb reactive against CD3, CD20, and HLA-DR, as described (25). Nondepleted cells were then stained with CD56-PE mAb, washed in 10% HAB, and isolated by FACS for CD56+ NK cells on a Coulter ELITE flow cytometer (Coulter Immunology). Sorted CD56+ NK cells were routinely ≥97% pure by flow cytometric analysis. Sorted CD56+ NK cells were cultured in 10% HAB at a density of 1 × 106 cells/ml, in sterile 96-well U-bottom plates. NK cells were then stimulated with IL-15 (10 ng/ml), IL-12 (10 U/ml), IL-15 plus IL-12, or no stimulus (medium alone control). After a 72-h incubation at 37°C in 5% CO2, culture supernatants were harvested, centrifuged to remove cells and debris, and stored at −80°C. In some experiments, sorted CD56+ NK cells were cultured as described above, but at a density of 5 × 104/ml. NK cell production of MIP-1α, MIP-1β, and RANTES was measured from cell-free culture supernatants utilizing commercial ELISA kits, following the manufacturer’s instructions (R&D Systems). RANTES levels were corrected for any background obtained from the culture medium (10% HAB, ≤250 pg/ml). Results represent the mean of duplicate wells ± SD. PBMC from normal donors were prepared as described above and cultured in 100-mm tissue culture dishes at a density of 15 × 106/ml in 10% HAB. After 2 h, nonadherent cells were removed, centrifuged, and resuspended in RPMI 1640 supplemented with 10% FCS and antibiotics (10% FCS), and incubated with phytohemagglutinin (PHA, 5 μg/ml; Sigma) for 2–3 days. PBL were next washed twice in RPMI 1640, resuspended in 10% FCS supplemented with 10 U/ml IL-2, and seeded (2 × 105 cells/well) into 96-well flat-bottom plates for infection assays. PBL were then used as targets for infection assays 0–2 days following IL-2 stimulation (3–5 days postisolation). PBL prepared as described above were preincubated in 100% (v/v) NK cell-conditioned supernatants or controls, supplemented with 10 U/ml IL-2, for 1 h before infection. A molecularly cloned virus, HIV-1NFN-SX (26), encoding the envelope of the M-tropic isolate HIV-1JR-FL (27), was then added to the wells at a final input of 0.5 ng/ml p24 in a total volume of 100 μl, and incubated for 4 h at 37°C. Other viruses utilized included dual-tropic HIV-189.6 (28) (1 ng/ml p24) and T-tropic HIV-1NL4–3 (29) (5 ng/ml p24). Target cells were then washed twice with RPMI 1640 to remove excess unbound virus, and the NK cell-conditioned supernatants (100% v/v) or controls in 10% HAB were replaced. PBL were then cultured for 14 days at 37°C. On days 6, 8, and 10 postinfection, half of the culture supernatant (50 μl) was harvested for p24 assessment and replaced with 10% HAB supplemented with 10 U/ml IL-2. Target cells were monitored for viability during the course of the infection assays by vital dye exclusion. To examine the effects of the C-C chemokines, some NK cell supernatants were precleared of these chemokines with polyclonal neutralizing Abs (R&D Systems). Supernatants were first incubated with anti-human chemokine-neutralizing Abs (anti-MIP-1α, anti-MIP-1β, and anti-RANTES, each at 2–50 μg/ml, concentrations able to neutralize ≥95% of their activity as determined by the manufacturer) or an equivalent amount of normal goat Ig (6–150 μg/ml) for 1 h at 4°C with gentle agitation. Protein G-Sepharose (Bio-Rad, Hercules, CA) was then added, and the supernatants were incubated with gentle agitation for an additional hour. The protein G-Sepharose was then pelleted by centrifugation, and the chemokine-cleared supernatants were transferred to another microfuge tube without disturbing the Sepharose pellet. 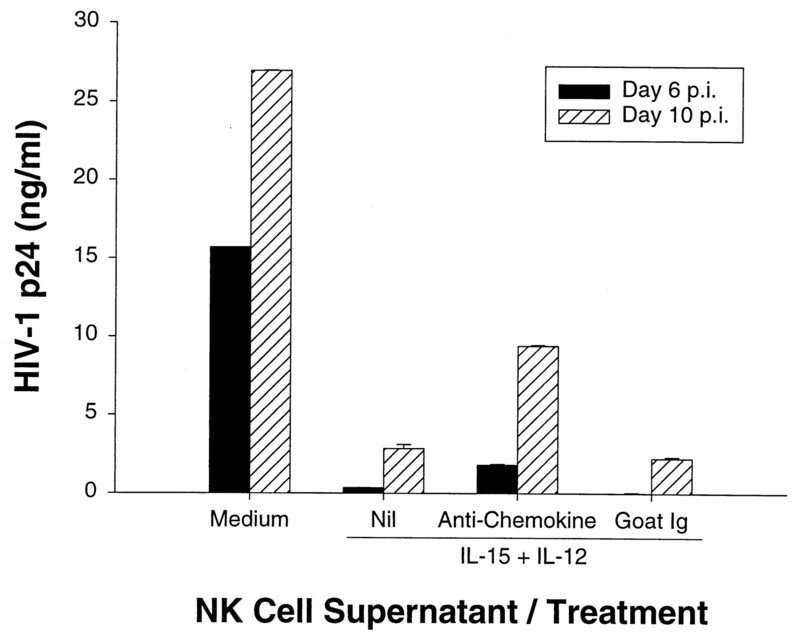 This clearing process resulted in monokine-stimulated NK cell supernatants with undetectable MIP-1α, MIP-1β, RANTES, and goat Ig protein by ELISA (data not shown). Target cells infected and cultured in fresh 10% HAB supplemented with 10 U/ml IL-2 and uninfected target cells were additional controls. Quantitation of HIV-1 p24 protein production in the supernatants of infected targets was performed using a commercial p24 Ag capture ELISA kit (AIDS Vaccine Program, Frederick, MD), following the manufacturer’s instructions. Statistics were determined by using the Student t test, with p < 0.05 considered significant. Human NK cells produce MIP-1α and a variety of cytokines in response to stimulation with the monokine combination IL-15 plus IL-12 (7, 9). We therefore assayed NK cells from normal donors and HIV+ patients for production of the known HIV-1-suppressive C-C chemokines MIP-1α, MIP-1β, and RANTES (13). Fig. 1⇓ shows the levels of these C-C chemokines in NK cell culture supernatants obtained from normal (n = 8) and HIV-1+ (n = 7) donors (5 × 104 cells/ml). NK cells from HIV-1+ patients produced equivalent amounts of MIP-1α, MIP-1β, and RANTES in response to IL-15 plus IL-12, when compared with normal donors. Supernatants from NK cells activated with the combination of IL-15 plus IL-12 showed the greatest and most significant increase in MIP-1α (p < 0.0008) and MIP-1β (p < 0.0003), when compared with supernatants from NK cells cultured in medium alone. RANTES was measurable but not significantly different under any culture condition in NK supernatants from normal or HIV-1+ individuals (data not shown). Monokine-stimulated NK cells purified from normal donors and HIV+ patients produce abundant C-C chemokines in vitro. Human NK cells were isolated by FACS (≥98% purity), plated at 5 × 104/ml, and stimulated with medium (control), IL-15, IL-12, or IL-15 plus IL-12. 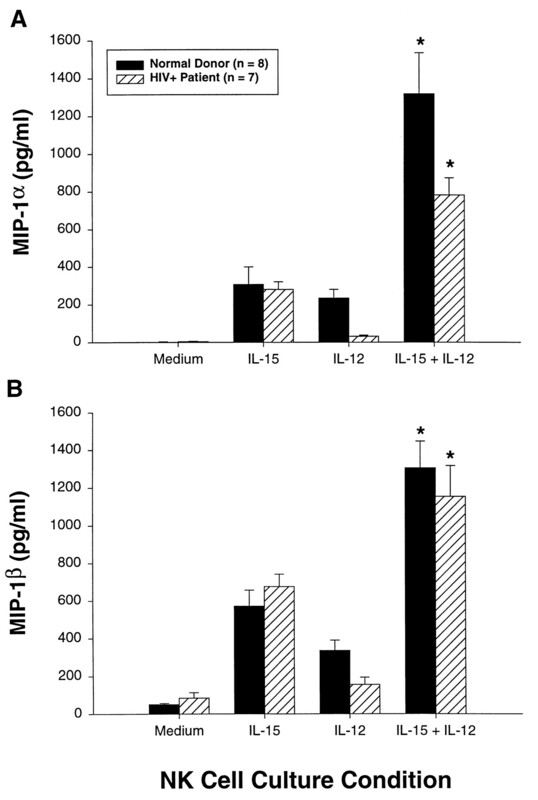 After 72 h, cell-free culture supernatants were harvested and assayed for (A) MIP-1α and (B) MIP-1β levels by ELISA. Results represent the mean ± SD of eight normal donors and seven HIV+ patients. There was no significant difference between normal and HIV+ donor NK cell production of these C-C chemokines in response to IL-15 plus IL-12. There was a significant increase in the production of MIP-1α and MIP-1β (*, p < 0.008) by IL-15 plus IL-12-stimulated NK cells from both HIV-1+ and normal donors, compared with unstimulated (medium) controls. We next investigated the ability of supernatants from monokine-stimulated NK cells to inhibit HIV-1 replication in vitro. We used the M-tropic HIV-1NFN-SX (26), which utilizes CCR5 as a coreceptor. The effect of normal donor NK cell supernatants on viral replication was assessed by comparing unstimulated (medium only) to monokine-stimulated NK cell supernatants. Supernatants from unstimulated and IL-15-stimulated NK cells produced high amounts of HIV-1 p24 by day 6 postinfection of target PBL (Fig. 2⇓). Supernatants from IL-12-stimulated NK cells reduced HIV-1 p24 levels by approximately 50% (p < 0.03), compared with medium controls. However, PBL targets infected and cultured in supernatants from NK cells stimulated with IL-15 plus IL-12 demonstrated ≥95% decrease in p24 production, compared with medium controls (p < 0.0005). We also quantitated the levels of C-C chemokines in the IL-15 plus IL-12-stimulated NK cell supernatants (cultured at 1 × 106 cells/ml) shown in Fig. 2⇓, and the mean ± SEM (pg/ml) were 27,442 ± 4,668 for MIP-1α, 29,295 ± 4,887 for MIP-1β, and 4,576 ± 1,482 for RANTES. To control for the direct effects of any remaining rIL-15 and rIL-12 in the NK cell supernatants, the residual amounts of these cytokines were quantitated (15–30% of input for rIL-12, 35–50% of input for rIL-15), and these levels were assayed for any effects on HIV-1NFN-SX replication. In our infection system, rIL-12 did not change p24 production compared with medium alone, while IL-15 and IL-15 plus IL-12 modestly increased (1.5- to 2-fold) p24 production (data not shown). Therefore, we concluded that these recombinant cytokines were not directly involved in the observed inhibition of p24 production by stimulated NK cell supernatants. Monokine-stimulated NK cell culture supernatants inhibit HIV-1 replication in PBL targets in vitro. Human NK cells were cultured (1 × 106/ml) in medium, IL-15 and/or IL-12, for 72 h. PBL targets from healthy donors were preincubated (1 h) with the NK cell supernatants (100% v/v) and then infected with 0.5 ng/ml HIV-1NFN-SX. PBL targets were washed extensively after 4 h and again cultured with the NK cell supernatants. A, Culture supernatants were harvested at days 0, 6, and 8 postinfection and tested for p24 production by ELISA. Results shown are the mean of duplicate measures and are representative of three separate experiments. B, The percentage of p24 production of control supernatants (medium) was calculated at day 6 postinfection, and the mean ± SD of three separate experiments is shown. Supernatants from NK cells stimulated with IL-12 alone (**, p < 0.027) and IL-15 plus IL-12 (*, p < 0.0005) significantly decreased HIV-1 p24 production compared with medium controls. To directly verify that the inhibition by normal donor NK cell supernatants was also operating in HIV-1+ patients, we tested the supernatants of monokine-stimulated NK cells isolated from HIV-1+ patients for the ability to suppress HIV-1 replication in vitro. Extended leukopheresis of HIV-1+ patients for the purpose of this in vitro assay could not be justified on ethical grounds. Sufficient numbers of human NK cells were therefore isolated from two AIDS patients that had received s.c. ultra-low dose IL-2 (1.2 × 106 IU/m2/day) and, hence, had an expanded NK cell population (23). Supernatants from their NK cells that were activated by IL-15 plus IL-12 significantly decreased HIV-1 replication in vitro by ≥90%, compared with unstimulated control supernatants (Fig. 3⇓, p < 0.0024). Likewise, identical supernatants obtained from monokine-activated NK cells of one HIV-1+ patient on highly active antiretroviral therapy (HAART) and not receiving IL-2 inhibited HIV-1 replication in vitro by ≥90% (data not shown). Monokine-stimulated NK cell supernatants from two AIDS patients receiving ultra-low dose IL-2 therapy inhibit HIV-1NFN-SX replication in vitro. In vitro infection assays were performed as described in Fig. 2⇑ and Materials and Methods and compared with unstimulated NK cell supernatant controls. Results are shown as the mean percent HIV-1 p24 ± SD of medium control supernatants at day 6 postinfection, and demonstrate a significant decrease with IL-15 plus IL-12-stimulated NK cell supernatants (*, p < 0.0024). To assess whether the measured C-C chemokines were responsible for the observed suppression of HIV-1 replication, we utilized neutralizing Abs to MIP-1α, MIP-1β, and RANTES to block their effects on HIV-1 replication. Fig. 4⇓ shows that the inhibition of p24 production by stimulated NK cell supernatants could be only partially abrogated by preclearing with neutralizing Abs against MIP-1α, MIP-1β, and RANTES, compared with supernatants mock cleared with an equal amount of nonreactive goat Ig. To insure that partial abrogation was not a result of insufficient amounts of the neutralizing Abs, the experiment was repeated using a 25-fold excess of the concentrations necessary to neutralize the measured amounts of chemokines present in the supernatants and yielded similar results (data not shown). Neutralizing Abs to MIP-1α, MIP-1β, and RANTES only partially block NK cell supernatant inhibition of HIV-1 replication. In vitro infection assays were performed with HIV-1NFN-SX as in Fig. 2⇑, with the exception of preclearing the NK cell supernatants with the indicated neutralizing Abs as described in Materials and Methods. Infection culture supernatants were harvested at days 6 and 10 postinfection (p.i.) and assayed for p24 production by ELISA. Results are representative of two separate experiments and presented as the mean ± SD of duplicate measures. We also examined the effects of NK cell supernatants on the replication of two additional HIV-1 strains, the T-tropic HIV-1NL4–3 that utilizes CXCR4 as a coreceptor for entry and the dual-tropic HIV-189.6 that can utilize either CCR5 or CXCR4 as a coreceptor, as well as several other potential HIV-1 coreceptors (30). 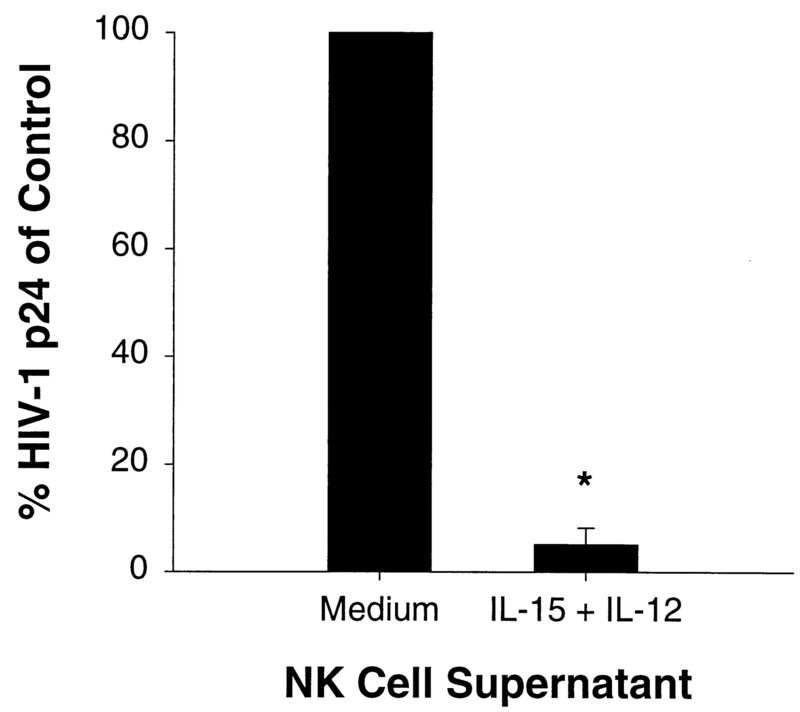 Supernatants from NK cells costimulated with IL-15 plus IL-12 significantly inhibited the replication of HIV-1NL4–3 by ≥75%, compared with unstimulated control supernatants (Fig. 5⇓, p < 0.0013). However, identical monokine-stimulated NK cell supernatants were not able to significantly inhibit the replication of HIV-189.6, compared with controls. Supernatants from monokine-stimulated NK cells inhibit HIV-1NL4–3, but not HIV-189.6, in vitro. Infection assays were performed as described in Fig. 2⇑ and Materials and Methods, with the T-tropic HIV-1NL4–3 and dual-tropic HIV-189.6. A and C, The amount of HIV-1 p24 was quantitated at days 0, 6, and 10 postinfection with HIV-1NL4–3 or HIV-189.6. Results are representative of two separate experiments and presented as the mean p24 (ng/ml) from duplicate measures. B and D, There was a significant decrease in percentage of HIV-1 p24 produced in the IL-15 plus IL-12-stimulated NK cell supernatants when infected with HIV-1NL4–3 at day 6 postinfection (p < 0.002), while there was no significant difference observed with HIV-189.6, when compared with medium controls. Monokine-stimulated human NK cells have been previously shown to produce several cytokines and the C-C chemokine MIP-1α in vitro (7, 9). In this report, we demonstrate that monokine-stimulated NK cells, isolated from HIV-1+ donors, also produce the C-C chemokines MIP-1α and MIP-1β in amounts equivalent to normal donors. We therefore tested whether such monokine-stimulated NK cell supernatants were able to inhibit M-tropic HIV-1NFN-SX replication in vitro. The culture supernatants from normal donor NK cells stimulated with IL-12 alone inhibited HIV-1NFN-SX replication by approximately 50%, and NK cells stimulated with the combination of IL-15 plus IL-12 significantly inhibited HIV-1 production by ≥95%, compared with medium controls. In addition, IL-15 plus IL-12-stimulated NK cells isolated from HIV-1+ patients, or AIDS patients receiving ultra-low dose IL-2 therapy, also inhibited HIV-1NFN-SX replication by ≥90%, compared with medium controls. Therefore, human NK cells from normal donors and HIV-1+ patients inhibit HIV-1 infection in vitro. We next investigated whether the measured C-C chemokines present in the NK cell supernatants were responsible for the observed suppression of HIV-1NFN-SX replication in PBL targets. Interestingly, these known inhibitors of M-tropic HIV-1 replication were only partially responsible for the HIV-1 suppression from the stimulated NK cell supernatants. These data suggest that other factor(s) produced by monokine-stimulated NK cells inhibit M-tropic HIV-1 infection in our assay system. Possible candidates would include unidentified C-C chemokines, which may be able to block HIV-1NFN-SX infection via binding to CCR5, as well as other factors yet to be fully characterized (31). Since IL-15 plus IL-12-stimulated human NK cells are potent producers of IFN-γ and TNF-α (7), experiments are currently underway to evaluate their role in the HIV-1-suppressive effect of these supernatants. In addition, supernatants from stimulated NK cells significantly inhibited the replication of T-tropic HIV-1NL4–3. This observation suggests that factor(s) produced by NK cells may inhibit the usage of CXCR4 as a coreceptor for viral entry by T-tropic HIV-1, or that NK cell supernatants also exert suppressive action at another point in the viral life cycle. To our knowledge, human NK cells have not yet been shown to produce a C-X-C chemokine that binds to CXCR4, and experiments are ongoing to identify such CXCR4 chemokine ligands within monokine-stimulated NK cell supernatants. One explanation why supernatants from stimulated NK cells were unable to inhibit dual-tropic HIV-189.6 may involve its use of many coreceptors for entry, including CXCR4, CCR5, CCR3, and CCR2b (30). In this scenario, factors within NK cell supernatants may not be able to block all possible coreceptors for HIV-189.6 fusion. Monocyte-derived macrophages can also be induced to produce C-C chemokines following LPS-stimulation, and these supernatants have been shown to inhibit replication of M-tropic HIV-1 strains in both monocyte-derived macrophages and CD4+ lymphocytes, but not T-tropic HIV-1 strains (32). Since the identification of chemokine receptors as coreceptors for HIV-1 entry (14, 15, 17), and ability of chemokine ligands to block entry (13, 18, 19), several studies have examined their importance in the pathogenesis of HIV-1 infection. Studies have demonstrated that individuals homozygous for a 32-bp deletion in the CCR5 gene are resistant to HIV-1 infection, while heterozygous individuals have slower progression to AIDS (33, 34, 35, 36). Additionally, high-risk individuals who are multiply exposed, yet remain uninfected, have been shown to produce high levels of C-C chemokines (37). These studies highlight the importance of CCR5 interaction with its natural ligands and M-tropic HIV-1 in the natural history of HIV-1 infection. ultra-low dose IL-2 therapy has been shown in phase I and phase II trials to selectively expand CD56+ NK cells in vivo in patients with AIDS and AIDS malignancy (21, 23). Here, we show that NK cells obtained from these patients can be stimulated to suppress HIV-1 replication in vitro. Thus, the IL-2-expanded NK cell may be an endogenous source of C-C chemokines and, through the elaboration of these and possibly other factors, may contribute to defense against HIV-1 infection in patients receiving ultra-low dose IL-2 therapy. Note Added in Proof. A recent report by Oliva et al. (38) described a similar role for NK cell suppression of HIV-1 infection in vitro. We thank Andy Oberyszyn for cell sorting and Dr. Patrick Green for his invaluable advice. ↵1 Supported by Grants P30CA16058, CA09581, CA68456, CA65670, CA/AI81542 (to M.A.C.) and NS-35705 (to W.A.O.) from the National Institutes of Health. T.A.F. is the recipient of the Howard Hughes Medical Institute (Chevy Chase, MD) Research Fellowship for Medical Students and of the Bennett Fellowship from Ohio State University College of Medicine. ↵3 Abbreviations used in this paper: MIP; macrophage inflammatory protein; M-tropic, macrophage-tropic; T-tropic, T cell-tropic; HAB, human AB serum; rh, recombinant human; PE, phycoerythrin.